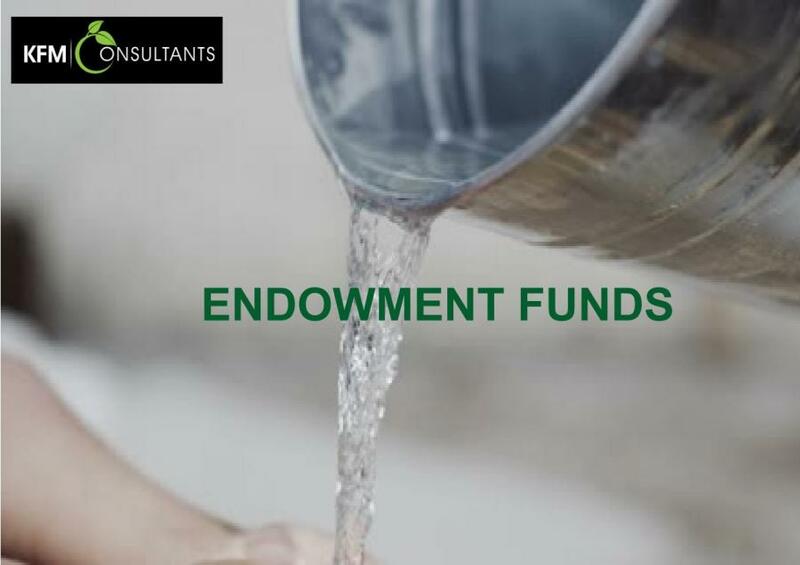 The term “Endowment Fund” is loosely used in Non-Profit Organisation circles to refer a general reserve set aside for a rainy day or substantial money in the bank that earns interest. There are organisations that use so-called Endowment Funds to provide staff salaries advances during dry spells or just to meet occasional staff needs such as children’s school fees, unanticipated expenses among other things. Technically speaking, Endowment funds are typically structured so the principal amount invested remains intact, while investment income is available for immediate funding for use to keep a non-profit organisation operating efficiently (Investopedia, 2018). Endowment funds are usually permanently restricted funds provided by donors because they believe in the long-term sustainability of the organisation. In some cases, management or a board of directors may set aside permanently restricted funds for investment purposes; these are referred to as “Quasi-Endowment Funds”. A myopic point of view will ask “Why would a donor give an organisation funding so that it cannot be used for a long period of time when there are always urgent programming needs that need to be addressed?” The answer lies in the period covered by such donors’ strategy. Wealthy individuals normally create foundations which they expect to exist in perpetuity, carrying the founders’ names along. They have funds that can be set aside for distant future purposes whilst at the same time earning modest income for current operations. Additionally, the foundation founders also want their children to inherit honourable status in certain communities and hence would want to support needs for the next generations. In addition to seeking funding for immediate and medium-term needs, NPOs should also seek endowment funding from huge organisations. There is a myriad of benefits that come with seeking endowment funding. By nature, the endowment fund is restricted but the period income from it (interests, dividends) is usually unrestricted. It can be used to fund administrative costs that other sources of funding may not be at liberty to fund. So the endowment fund effectively takes away the burden of unfunded administrative costs. An organisation that has an endowment fund in place carries a very good reputation within the community as it is signalled to last for a long time, impacting the community in a positive way. This positive sustainability perception also attracts other potential donors which would be keen to be associated with the organisation that not a fly-by-night and is likely to continue impacting the community. Resource mobilisation for the organisation would be seamless, resulting in organisational growth in terms of both funding base and impact. Endowment funds are particularly effective if they are denominated in stable currencies that can be invested is stable capital markets where they can earn decent income streams whilst also at least maintaining the principal value. Zimbabwe on the other hand has experienced its fair share of economic woes dating back to the hyperinflation era of 2008 and the more recent RTGS and Nostro balances shenanigans which is viewed by many as the return of troubles experienced a decade ago. If a donor had provided endowment funding for an organisation before the bond notes were put in place, part of that fund would have been diluted in RTGS funds and lost real purchasing power and the interest payments from it would be inadequate for the organisation’s operations. In a volatile economic environment like Zimbabwe, management of endowment funds would need to be managed by capable investment managers who would employ more active rather than passive methods of investment. Instead of depending of interest accruing in the savings account, the organisation can benefit more from the work of fund managers who would invest the money in a number of assets that would preserve the value of the fund despite inflationary and currency depreciation pressures. There are various options that can be considered in preserving the real value of endowment fund. The Exchange Control Directive RT120 of 2018 ( (Reserve Bank of Zimbabwe, 2018) provided guidance on the various foreign currency accounts that can be opened by organisations. An endowment fund can be wired to a designated International Organisations FCA where the hard currency value of the endowment account can be preserved. Restrictions can be placed such that the money cannot be used for purposes other than investment in local foreign currency instruments to generate foreign currency income for the organisation. A money market investment is a low risk investment that accrues interest on the principal amount and reinvested amount. In the current environment, banks and investment managers are only offering money market products based on RTGS Nostro FCA accounts. Therefore, in the current situation the money market is not a safe haven for endowment funds due to the risks associated with RTGS FCA accounts. The money market would only be a viable option once we have a money market for Nostro FCA balances. Equities are relatively high risk investments whose returns are depended on their anticipated future performance of the underlying companies. The share price of a company with good prospects will increase to show the increase in value whilst that of a struggling company will decline. However, the performance of a company cannot always be accurately forecasted and is subject to perceptions of analysts and investors. Therefore, there is a risk that a share price can in fact fall even when analyst forecasts point towards increased value. The companies can also be affected by unanticipated macro-economic factors that can throw off analysts’ expectations. Therefore, since donors are keen on maintaining the principal value of the endowment fund, equities are not the best investment haven for the funds. In Zimbabwe, companies are predominantly trading using RTGS accounts so their performance will be in RTGS terms and may not mirror the real value differential between Nostro FCA and RTGS FCA. Thus, the foreign currency value of an endowment fund would be exposed to RTGS risk if the funds are invested in equities. For the period between 1 October 2018 and 7 January 2018, the Zimbabwe Stock Exchange (ZSE) Industrial Index has only gained 13% (420.80 to 477.52) ( (African Markets, 2018) whilst the parallel market value of RTGS balances against the greenback has depreciated astronomically. Therefore, the real value of an endowment fund invested in equities would have declined by the differential between the ZSE Index and the USD/RTGS parallel market rate. Property investment represents a long-term investment which is unlikely to be affected by short-term fluctuations in exchange rates. Generally, property values appreciate rather than depreciate and are often subject to periodic upward revaluation. The return on an investment in property is composed with this appreciation in property value and the rental incomes that come from that property. Since rentals often track inflation, which can in turn be influenced by exchange rates (especially in an import dependent country like Zimbabwe), the real value of investment in property tends to be at least maintained. Property investment is ideal for endowment funds, even in a volatile economy like Zimbabwe due to the issues described above. In other developed markets, organisations can invest in Real Estate Investment Trusts (REITS) which will distribute at least 90% of the periodic incomes from property investments. An international organisation wishing to provide an endowment fund for a local NPO may opt to open an investment account outside Zimbabwe such that the principal amount of the endowment fund would be maintained offshore whilst the interest/dividend income from that fund would be channelled to the organisation in Zimbabwe for administrative purposes. However, due to exchange control regulations in Zimbabwe, local organisations would need to seek approval from the Reserve Bank of Zimbabwe before they can open offshore bank/investment accounts. It would be ideal for the foreign investment account to be opened by the international organisation. However, this would place unwelcome administrative burden on the international organisation. Endowment funds are an ideal way of ensuring the sustainability of an organisations. The investment options for these funds would have to be in line with the funding organisation’s investment charter/policy which would be communicated to the recipient organisation. Zimbabwean organisations can leverage on existing relations with donors to solicit for endowment funds for future sustainability.